Dang Q, Song W, Xu D, et al. Kaempferol suppresses bladder cancer tumor growth by inhibiting cell proliferation and inducing apoptosis[J]. Molecular carcinogenesis, 2014. Human bladder cancer cells were treated with caspase 3/7 inhibitor 1 (10 μMM) or kaempferol (100 μM) for 48 h; In combination treatment, caspase 3/7 inhibitor 1 was added 1 h prior to kaempferol treatment. 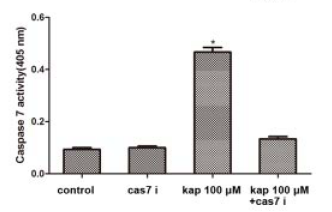 At the end of treatment, cell extracts were prepared for caspase-7 activity assay. Error bars represent SEs. *P < 0.05. A potent, cell-permeable, and specific, reversible inhibitor of caspase-3 (Ki = 60 nM) and caspase-7 (Ki = 170 nM). Cells were treated with camptothecin to induce cell death, and the ability of the compound to inhibit cell death was assessed by FACS analysis. A good correlation exists between relative cell-based activities of the compound with its in vitro isolated caspase 3 or 7 inhibition activites. The compound exhibited 54% inhibition of apoptosis at 50 μM and 22% at 10 μM. Lee D, Long S A, Murray J H, et al. Potent and selective nonpeptide inhibitors of caspases 3 and 7. 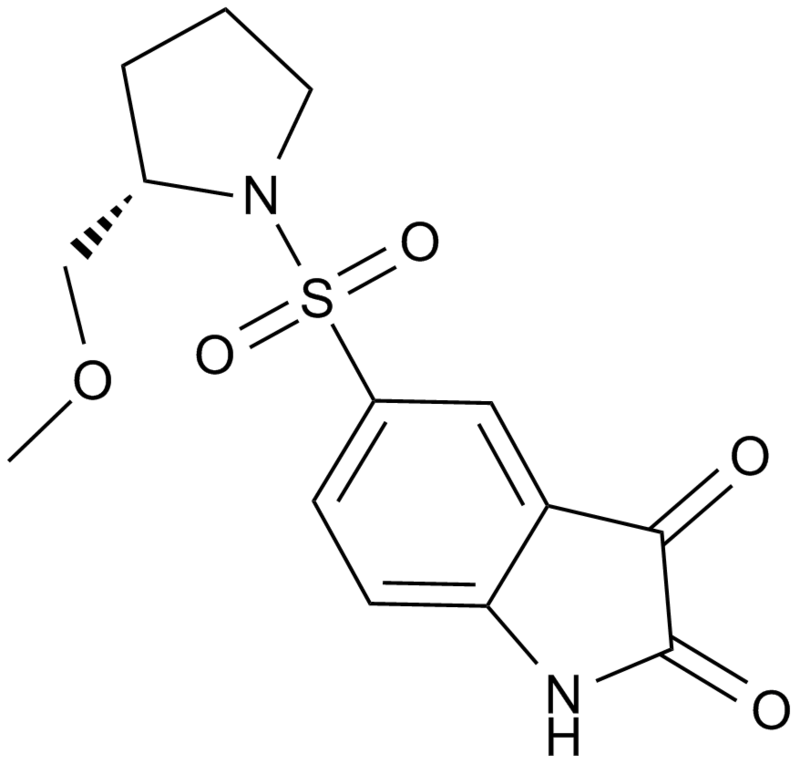 Journal of medicinal chemistry, 2001, 44(12): 2015-2026. 1. Tissue inhibitor of metalloproteinases-3 moderates the proinflammatory status of macrophages. Am J Respir Cell Mol Biol. 2013 Nov;49(5):768-77. doi: 10.1165/rcmb.2012-0377OC. TIMP-3 is involved in the regulation of inflammation where, in the absence of TIMP3, macrophages are more likely to be differentiated into proinflammatory (M1) cells. 2. [X-linked inhibitor of apoptosis protein (XIAP) and Survivin suppression on human pancreatic cancer cells Panc-1 proliferation and chemosensitivety]. Beijing Da Xue Xue Bao. 2013 Apr 18;45(2):242-9. The effects of inhibition of XIAP, Survivin or both on cell proliferation and chemosensitivity of Panc-1 cells have been investigated and compared. 3. [Effect of aurora kinase B inhibitor AZD1152 in the treatment of cisplatin-resistant ovarian carcinoma]. Zhonghua Fu Chan Ke Za Zhi. 2013 Jan;48(1):46-50. The effect of AZD1152 alone or in combination with cisplatin has been investigated in the treatment of cisplatin-resistant ovarian carcinoma. 4. Targeting X-linked inhibitor of apoptosis protein inhibits pancreatic cancer cell growth through p-Akt depletion. World J Gastroenterol. 2012 Jun 21;18(23):2956-65. doi: 10.3748/wjg.v18.i23.2956. The regulation of XIAP gene by lentivirus-mediated shRNA has been investigated for its effect in the treatment of pancreatic cancer. 5. Mechanisms of cisplatin-induced cell death in malignant mesothelioma cells: role of inhibitor of apoptosis proteins (IAPs) and caspases. Int J Oncol. 2013 Feb;42(2):444-52. doi: 10.3892/ijo.2012.1715. Epub 2012 Nov 28. Z-DEVD, a selective caspase 3/7 inhibitor, didn’t affect the sensitivity of three mesothelioma-derived cell lines to cisplatin. 1. Lee, D., et al. 2001. J. Med. Chem. 44, 2015. 2. Lee, D., et al. 2000. J. Biol. Chem. 275, 16007. 3. Clements, K. M., Burton‐Wurster, N., Nuttall, M. E., & Lust, G. (2005). Caspase‐3/7 inhibition alters cell morphology in mitomycin‐c treated chondrocytes. Journal of cellular physiology, 205(1), 133-140.